Guideline Number One: Be consistent as possible, but recognize you'll never be consistent. You'll hear a lot of defense attorneys telling you that your job is to seek justice. This is absolutely correct. However, while I agree with the concept of seeking justice, I suspect that we will disagree as to the meaning of that phrase. When a defense attorney says it to you it generally translates as "let my guy go" or "give my guy a better deal." When I say it, I mean be as consistent as possible in your application of the law (particularly in sentencing). You will exist in an atmosphere where all sorts of things will limit the range within which you can operate. Among these will be sentencing guidelines, office policies, and the proclivities of your judges. Nevertheless, there will be always be decisions that you have to make on your own. Even if you are just the new guy trying traffic offenses there will be some things that you will be making the call on. Set guidelines for yourself. Notice that I said guidelines not commandments. These are not carved in stone edicts from God. You will vary from these guidelines. How often you vary will depend on your personal sense of equity, but if you never vary from them you have either set them too loose or you are simply not ever considering mitigating facts. Say you are the traffic prosecutor for your county and the highway through the county has a speed limit of 55 mph. Reckless driving by speed (class one misdemeanor up to 12 months in jail and/or $2,500 fine) is 20 mph over the speed limit. You set your guidelines at 75-80 mph and no previous speeding related offenses within 10 years gets driving school and reduction to simple speeding (fine only); 75-90 mph gets a $500 fine and suspended jail time; 91-100 mph gets 1 day in jail for every mph over 90 and a $750 fine; and 101 and above gets 30 days in jail and a $1,000 fine. Most of the time you will ignore whatever excuse (he had to get to a restroom, her speedometer was broken, he accidentally engaged the nitro, &cetera) and simply follow your guidelines. However, there will be times you vary from the guidelines either way. Defendant was driving 96 mph trying to get his wife to the hospital for the birth of their child and Officer Newbie pulls them over and gives them a reckless driving summons; you should probably not throw that Defendant in jail. On the other hand, if Mary is in court for her 4th reckless driving summons in six months (each time at 85 mph and because she was late for work) you should probably give her at least a weekend in jail. Applying the same guidelines to the vast majority of situations means that people who do similar things will be treated in a similar ways and this is important to justice. People should be treated the same if they did the same thing. The guidelines you set also have the advantage of predictability. Defense attorneys will approach you as a known quantity and be able to advise their clients appropriately. "You locked your dog in your house four hours earlier and you were trying to get home before she messed on your brand new carpet? I'm sorry, but Prosecutor Smith isn't going to drop your reckless driving at 92 miles per hour because of that. The punishment for driving that fast is . . ."
Understand, you will never be entirely consistent. There are too many variations in circumstances of arrest. You will also make mistakes. Defense attorneys will constantly push you. The clever ones will try to use your guidelines against you once they've figured them out. "You never send anyone to jail who hasn't gone over 90 mph; it isn't fair to send my lady to jail at 86 mph." The really clever ones will remember instances in which you varied from your guidelines and try to use those as wedges to get their clients better deals. "Last month you didn't send that Smith guy to jail and he was driving 107 mph. My client is a college student just like he was and should not go to jail either." Of course, the attorney won't mention the facts which made the Smith case unique and different from his client. And it is unlikely that you will remember the facts of the Smith case. Stick by your guidelines unless your examination of this particular case tells you that you should deviate. Can You Steal From the Dead? Must Prosecutors Disprove Affirmative Defenses? 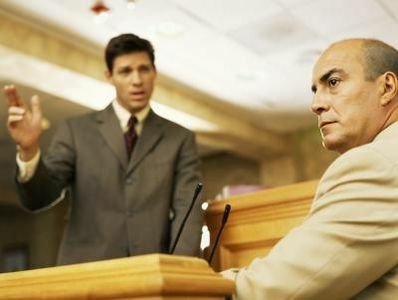 Should Lawyers Make Clients Confess? In case anyone out there needs this warning: This ain't legal advice. Everything in the blog is off the cuff and no one goes back and reads all the cases and statutes before blogging. The law may have changed; cases misread and misunderstood two years ago can still lead to a clinging misperception. Courts in your county, city, or State probably don't operate as described herein. Feel free to be inspired, but YOU MUST ALWAYS DO YOUR OWN RESEARCH OR HIRE A COMPETENT ATTORNEY TO DO SO because I haven't. What Makes a Good Drug Court? All posts copyright Ken Lammers Jr.